Welcome to the virtual visit to Puig Ciutat. Here you can see the different information panels that explain the site and its additional contents. 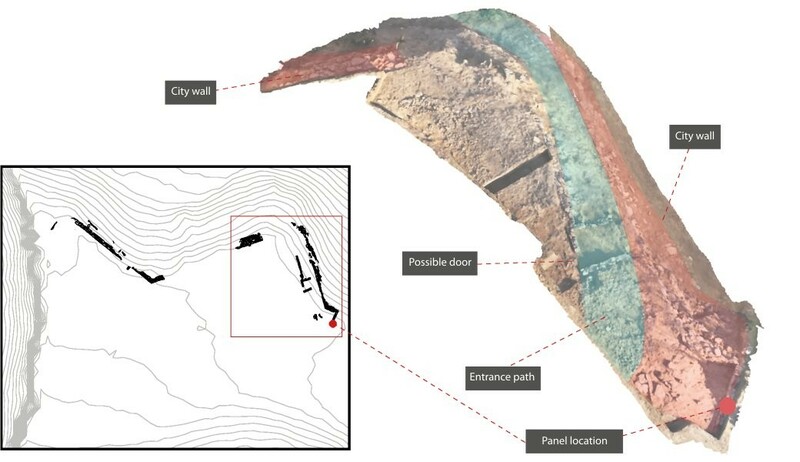 Touch the indicators on the map to see the panels and the 3D models of the excavations. The archaeological site of Puig Ciutat is located in the municipal district of Oristà (Barcelona province). The archaeological site is currently located at the top of an elevated plain 526 metres (1,700 ft) above sea level. It covers a surface area of 5.1 hectares (12.6 acres), distributed over farmland and steeply sloping areas. The hill is surrounded by two watercourses, the river Gavarresa and one of its affluents, the river Olost, which make the site very valuable from a defensive and strategic point of view. What is its historical context? Research has revealed archaeological evidence of different chronological phases that go from the Late Bronze Age or Early Iron Age to the Late Roman Republican Period (mid-1st century BC). Most of the information we have at the moment relates to the late Roman Republican period. At that time, Puig Ciutat could have played a role as a garrison or military camp (praesidium). At the end of this period Rome’s Civil War between Julius Caesar and followers of Gnaeus Pompeius took place (BC 49 – 44). 1) A tour of the interior of the site: there are five information panels describing the settlement during the Late Republican Roman Period. The panels have QR codes to complement and enlarge on the information. 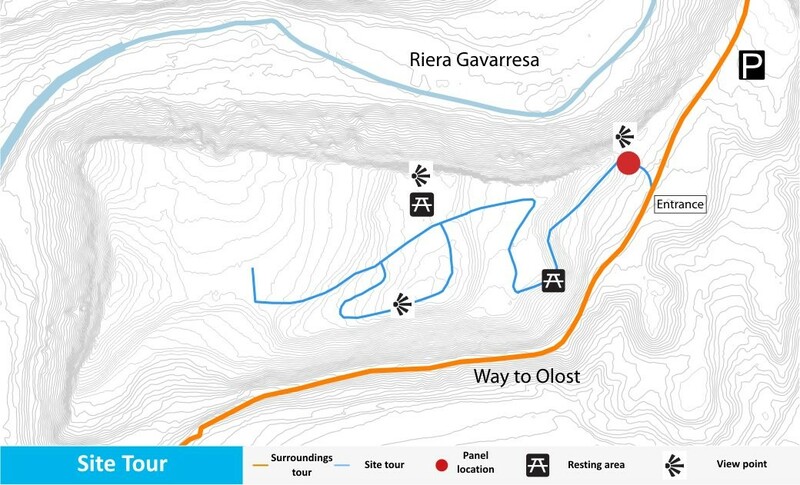 2) A tour of the site surroundings: provides a picture of the surrounding area and describes the geographical and natural conditions of Puig Ciutat. Was Puig Ciutat a strategic control point? The location of the settlement makes it very valuable from a defensive and strategic point of view as access is only by two natural routes to the north and south. However, the poor long-distance visibility might have made it necessary to have several control points in the vicinity. In two of the excavated areas a city wall from the Late Roman Republican Period was discovered. The section of wall described in this panel is not currently visible. Until it has been consolidated, it has been covered over again to ensure its conservation. Where was the way in? The archaeological excavations suggest that the wall bordered the settlement on the east and south sides of the hill. It’s difficult to know the exact location of the gates in the wall, on account of its eroded state. However, certain clues suggest the presence of a gate on the south-east flank of the site. The excavation has revealed a rectangular construction located inside the wall. Its purpose and date are unknown to us. It has a small, sealed entrance that could have been a second way into the settlement. Who were they defending themselves from? Roman military remains have been found in different parts of the site and its vicinity. This suggests a siege by Roman troops established in camps around the settlement. It’s therefore believed that there could have been a confrontation between Romans. This point was excavated to identify one of the rooms that had been best located in the geophysical surveys and that seemed to have been burned. We also wanted to check for the presence of a street crossing the camp from north to south, providing access from one of the gates in the city wall to the interior of the settlement. The room was built with walls of rammed earth on a socle of stone bound with mud, like the rest of the buildings from the Roman Republican Period. The roof, supported on oak beams, was made with twigs and waterproofed with clay. The room borders on the street to the west and has an opening on the southern side. The fact that the door opens to the south indicates that this room is part of a complex building. The material recovered doesn’t indicate a specific use for the room, as there were work tools (a saw, a pair of loom weights, etc.) as well as ceramic recipients for domestic use. Two amphorae have been located, one from the south of the Iberian Peninsula and the other from the Italian Peninsula, which speak for the transport of oil, wine or salted products (preserved fish). One outstanding set consists of a krater, a recipient used for mixing water and wine, and several little drinking glasses. The krater was from Sicily and the glasses from modern-day Italy. An Iberian ceramic playing counter was also recovered. Burnt ceiling beams. They must have been moved around to retrieve material once the battle was over. Projectiles (sling-bullets, catapult-bolts and javelin tips) above the ruins. These could only have been fired from the exterior. Front part of a dog trapped under the ruins. The rear, being exposed to the elements, was eaten by carrion-feeders. Archaeological excavations have revealed various compartments in one part of the north-east wall of the site. 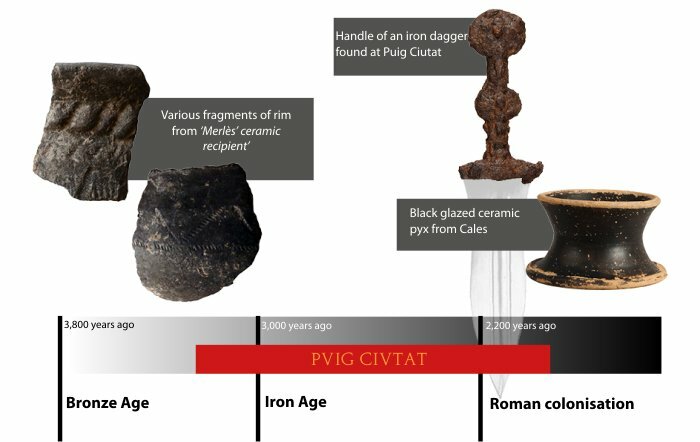 Thanks to the quality and the state of preservation of the archaeological material identified in this area, we can date the last occupation phase at Puig Ciutat to the middle of the 1st century BC. Among the archaeological remains, fragments were found of various ceramic recipients used for storage and transport of food products such as wheat, wine or oil. One room has a concentration of bones from large herbivores. It could well have been a place for storing meat or a stable. According to the research, the different rooms belonged to a complex building whose purpose is unknown to us. Some of the rooms could have combined different functions, as they were found to contain both material to do with the production of everyday elements and material relating to the storage, consumption and processing of food. What happened to Puig Ciutat? A large number of projectiles from an armed confrontation have been recovered. Burnt areas have also been located. This suggests that there was possibly violent destruction and the site was sacked. The distribution of these military elements in the various rooms in the area of the city wall speaks for an attack begun at this end of the settlement. Why is Puig Ciutat important? The process of Romanisation in the Lluçanès region is still not fully understood. Nevertheless, the study of this archaeological site could spur new research into this historical period in Central Catalonia. 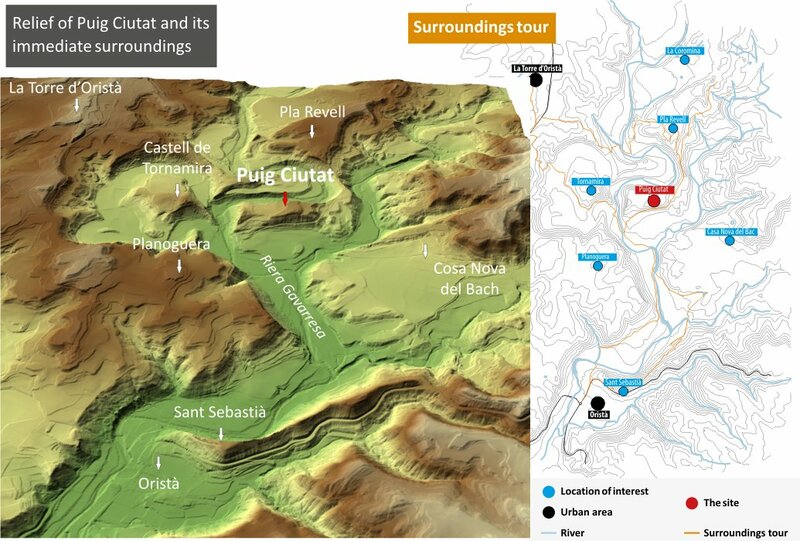 Since 2010, a team of researchers have performed various interventions on the Puig Ciutat site and its vicinity. These interventions were based on a multidisciplinary methodology which includes phases of surveying, excavation, treatment and publicising of the results. Reconnaissance and exploration of the archaeological area using satellite imagery, aerial photographs, topographical models, the search for surface remains (ceramics, metals, etc.) and geophysical methods. 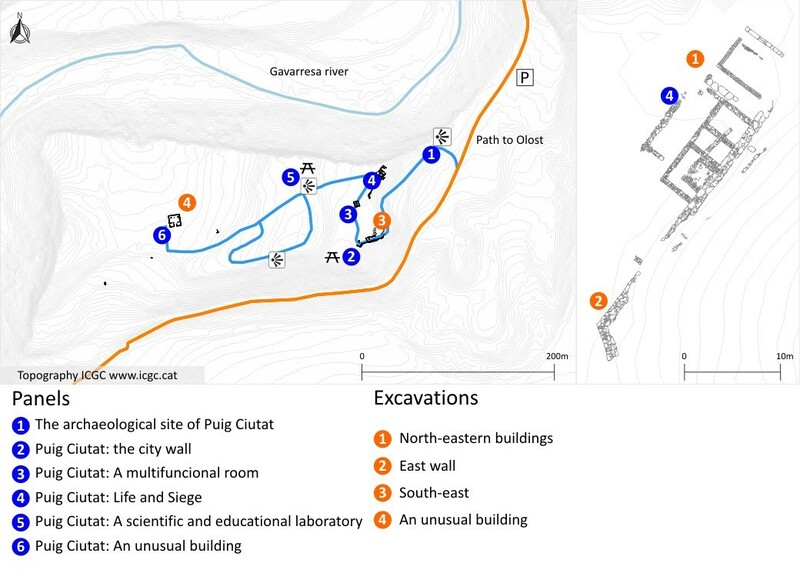 Detection, documentation and description of possible archaeological sites. Excavating a particular terrain to locate clues and evidence of ancient societies. Recording and documentation of the remains discovered during fieldwork and the stratigraphic information obtained. Classifying, restoring, digitising and interpreting the archaeological material (ceramics, metals, fauna, etc.). Initiation of studies and formulation of hypotheses among specialists in Archaeological Science. Informing society about the research undertaken on the basis of the site, through reports, guided visits, congresses and media. Socialisation of scientific and cultural knowledge for all publics. 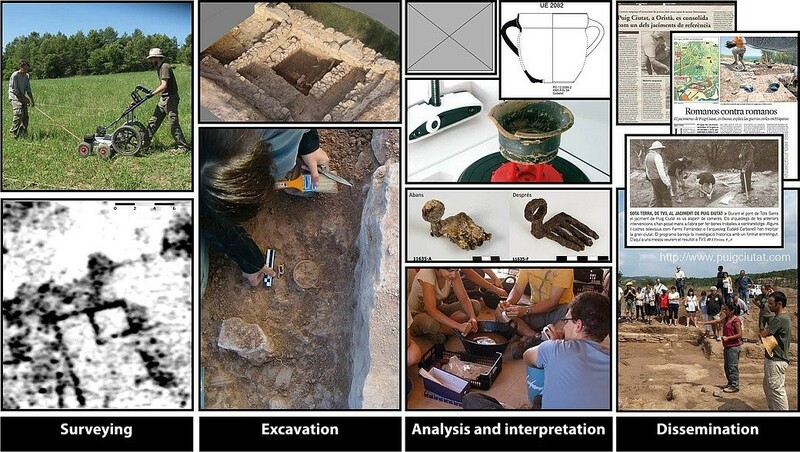 Archaeology, like any science, has its own methodology which is adapted according to the objectives and circumstances of each case being studied. In this respect, the work undertaken on the structures of the present building serve as an example to explain the scientific method applied in Puig Ciutat. The present state of the excavations does not yet allow an answer to many of the questions hinging on the site. 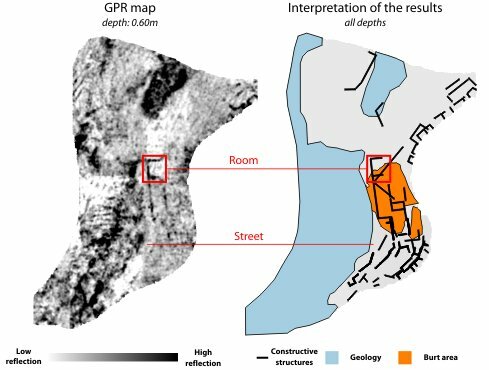 Nevertheless, geophysical surveying has made it possible to focus the excavation in those areas where the presence of built structures has been recorded. Thanks to this strategy, in a short time we have been able to obtain the largest possible quantity of data for drawing up the first interpretative hypotheses. Geophysical surveying has identified the presence of a building in the middle of the agricultural area. Some of the techniques used, such as ground-penetrating radar, have made it possible to define the geometry of the structure and establish its depth about 0.5 metres (20 inches) beneath the surface. A building measuring 11 x 11 metres with an entrance in the form of a passageway which very probably opened onto a distribution space inside. Two rooms have also been made out abutting the main façade and, finally, a space subdivided into four compartments at the back. The two innermost rooms are of a smaller size. In the course of the excavation, a large amount of carbon and shattered ceramics have been documented that suggest the building may have been destroyed. The building is an unusual construction that stands out in the settlement. Its size suggests it could be the residence of the commander or person in charge of the establishment praetorium) or a building with an important administrative function in the same context (principium). Although at present the data do not offer any more information about its purpose or its destruction, we hope to obtain more results in future work.